I’ve been pretty busy since I posted last… mostly holding off on the posts because I’ve been pretty bad about bringing my camera around. Labor day weekend was great- I went to Terrain with my mom for my birthday, and wandered around for a while. We had a great lunch, and mom picked up a few books- neither of us bought any plants this time though. I’ve run out of room on my kitchen sill, so I think I’m done with plants till next growing season. I went on another Dawn Patrol motorcycle ride with my dad on Sunday- what amazing weather! I really wish I had thought to make a neck strap for my camera so I could have had it out during the ride. There were some great skies and fantastic landscapes. We ended up riding with a huge group of people- it was pretty cool to see all the motorcycles ahead of us when riding down into a valley. But they rode really slow, and stopped at EVERY turn- lucky for us half the group missed one of the turns, and then a few turns later we passed the rest of them. (The rides are “Lyme dot” rides- one dot means to keep going straight, two means a left, three means a right. You also get a list with all the directions.) I like the rides better when its just me and my dad, maybe a few other bikes. As cool as the snaking line of motorcycles is, its way more relaxing not being part of a horde. The rides are really fun because they meander all through the area I grew up, but take interesting back roads and routes I don’t usually take. You get confused and lost, then cross an intersection and suddenly know exactly where you are. It ends at the Dawn Patrol club house, down the street from where the ride starts, with a huge BBQ party. Also- four finished projects in the last few days! I finally got through the green/lace top, bound off and blocked a hat (the one previously posted) and a cowl warmer, and finished a present that will head off in the mail sometime next week. Also, I’m making some good progress on the baby sweater I’ve been working on… ok, so the baby was born a few months ago, but I’m making it larger than the largest size on the pattern (more a mistake than a plan, but I think it will work out) so it should fit him anyway. Thinking of embroidering a “Q” on it, too… but we’ll see if that happens when I finish it. The cowl was a pretty fun fast knit, too. I bought the yarn on a whim when stopping by Rosie’s for some needles. Chris got me a gift certificate a while ago, in an attempt to get me to branch out and visit different stores- but I think I still like Nangellini the best, so I’ll stick with them. Anyway, I bought two balls of this, and thought that would be enough. Right after I cast on I took a look at the yardage, and was about 75 yards short of the required amount. I made a few alterations to the pattern- made the neck part a section narrower, cut the collar down in length and width. I cast off with about a centimeter left. Phewww! I think this will look pretty good with a coat, its perfect for late fall. So thats the craftiness- the other business—–this weekend was the final performance of Scorch, the great fire group I’ve been dancing with since the summer. Rehearsal on Thursday, performances on Friday and Saturday. I think it went really well, we got a great turn-out. It was free, but donations were collected to pay for the space and the fuel/safety equipment. I’m not sure of the final numbers, but I think we at least broke even, which is great, since the venue cost was a lot higher than the girls thought it was going to be. I got Chris to record our dance with his phone, and I’m sure there are a ton of photos floating around. A guy from cities2night was there, and those photos are here. Fire breathing at Michelle’s 30th, originally uploaded by ducksRfriends. Michelle had what has to be the best birthday party I’ve ever been to last night. It was a trifecta of birthdays- Michelle, her roommate, and a friend of theirs from highschool. The big 3-0…. what better time to get a bunch of awesome people together and throw the best bash ever? She hosted it in the courtyard outside of her warehouse space. A borrowed stage, lots of strategically placed lights, a giant grill (made by Tim) created out of a steel barrel, food, booze, cake- really everything you could ever want. Performances started at 9, and included a band, a burlesque show, two tribal troupes (one being me, Jes and Michelle, the other was Hipnosis), a hooper and three vignettes by the awesome Archedream. 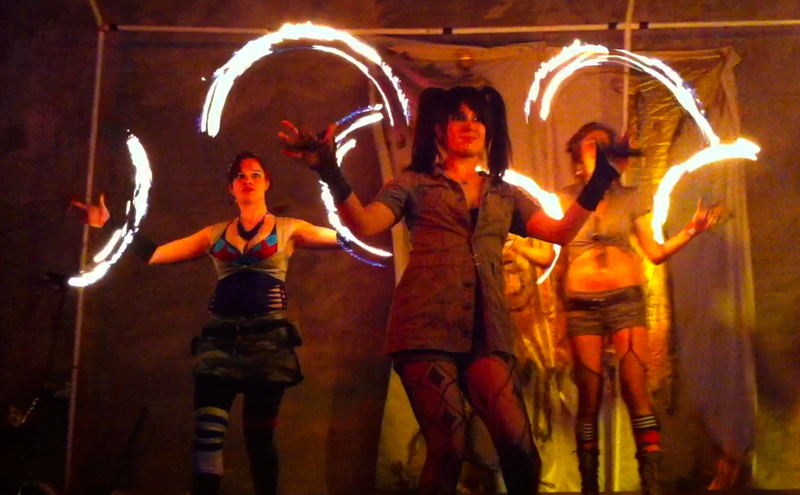 Then the DJ took over, and the fire spinners came out. The lovely ladies from Scorch and their fire-friends came and left the crowd to pick up their jaws… great performances. These two guys are my favorite fire breathers. I saw them at PEX, and that spiraling-up-passing-fire-along act is phenomenal. Once again, I didn’t take any photos myself. I really need to figure out a good way to carry a camera at these events. Tribal gear just doesn’t leave many options for camera cases. I’ll have to get something though- I wish I had gotten a shot or two of archedream. Guess I’ll just have to find another awesome party to go to and get some shots! Wow. This weekend was the first full run-through rehearsal, and it was awesome to see everything come together. The girls did a really great job. Everything from opera singers to fire hoopers to ex-Russian Circus performers…. I’ll just say that its going to be quite a performance. The show is called “Scorch” and is one of the acts performing at the PEX summer fest. (I’m filling in for a girl who couldn’t make it for the bellydance section.) I think that my excursion to Pennsic may have prepared me a bit for the camping/festival weekend (though hopefully we don’t have quite the floods at PEX!) and I’m looking forward to the workshops (silk fabric aerials!!) and swimming… But really I just can’t wait to see the performance in its full form! I’ve been waiting forever for my sea-monkeys to procreate. The little packet that came with them said one of the things that was great about the little shrimpies was that there were ‘multiple generations living together’. But I’ve had four huge-ish sea monkeys swimming around for ages. Two of them died over the long weekend…. so today I decided it was time to let them go. I air-ated their water and rinsed out the tank, none of the caution I’d previously had for the precious eggs that may or may not be there. And then the client I was editing with made a comment about how he was surprised I still had them… as I was pointing out the dead guys I never managed to fish out, I noticed little spots moving around. Babies!!! Finally, I will have more sea monkeys! A little sad that I’m so excited about mini-shrimp, but hey, its still pretty cool that they’ve finally procreated. On a non-seamonkey note, my co-worker Colleen posted up the cutest video of her daughter bellydancing. I’ve made some bellydance inspired flowers for her, and Colleen has shown her my troupe’s site… I imagine you wouldn’t have to show a young girl much for her to be drawn to the dance- awesome women, cool looking movements and best of all, totally fun costuming! I can’t wait to make more hair pieces for the two of them, I love when bellydance intersects with my ‘normal’ 9-5 life. This is a lovely little door at Rakkasah, a bellydance festival that is held at the Ukrainian Culture center in Somerset, NJ, twice a year. Its very Oz-like to buy your ticket. You lean down to the diamond (which is at the seated man’s eye line) and talk to the man behind the plywood, slide your money through the little slot. This time I learned something that makes that little ticket window even better… behind the curtain is the dancer’s dressing area. The ticket man basically gets stuck in the strange little area while all the ladies get changed, and people bring food and water to him when the room clears out of women in various states of undress. I took this photo for my mom, who always finds the ticket booth amusing. I overheard them saying they were going to try to make a new door for next year…. but I hope that this little window stays just the way it is. A few of the Rag Tag girls and I went to Somerset for the weekend to partake in Spring Caravan, the tribal version of Rakkasah. It was Angie’s birthday on saturday, so Jes and I suprised her with a cake that we picked up at a local bakery. The whole weekend was amazingly fun. Workshops, dancing, shopping, performing…. (Check out my dance blog for more about the whole weekend… will be posted soon) Really great to spend the weekend with girls I have so much fun with. Tuesdays are the best days. I head over to mugshots after work to relax before dance class. If I get out early enough, I get to curl up with a book and some tea and completely unwind. This week the weather was unbelievable. I stalked the outside tables, and as soon as I saw something open up, grabbed my bag and snagged the seat. Some icelandic music on my headphones, a mystery novel (Icelander… not the cause of the music, though) sent to me from my sister. Soon my dance friends show up and we work on our latest costuming and chat about the week, the troupe, anything. Then one of us catches the time, and we head off to class…. Wednesday this week wasn’t too bad either… I got my dance skirt in the mail this morning! Its wonderful and light and spins out amazingly. I can’t wait to dance in it!